Los Angeles (CNN) Colin Kaepernick took a knee. Donald Trump took offense. And now the world is paying attention. Trump has turned the protest into an anti-military, anti-cop, anti-patriotism crusade. A few other players joined Kaepernick in taking a knee in 2016. But he always remained the face of the movement. And it likely cost him his career in the NFL when he parted ways with the 49ers in the off-season and not a single NFL team picked him up in 2017. Kaepernick remained a talking point on sports radio shows. But the issue exploded when President Trump took the S.O.B. road. His comments seemed to unite NFL players, coaches and owners making “The National Anthem” protest a lead story across media platforms. Enter a new voice into the arena: WFAA-TV Sports Director, Dale Hansen. He’s a lifelong sports guy, a Vietnam veteran and a man who is fed up with racism in America. His impassioned commentary to his viewers went viral. Here’s a transcript. Former 49ers quarterback Colin Kaepernick takes a knee during the national anthem in San Francisco last year. We noticed, but very few players joined him. He can’t get a job in the NFL now, and very few have said much about that, either. 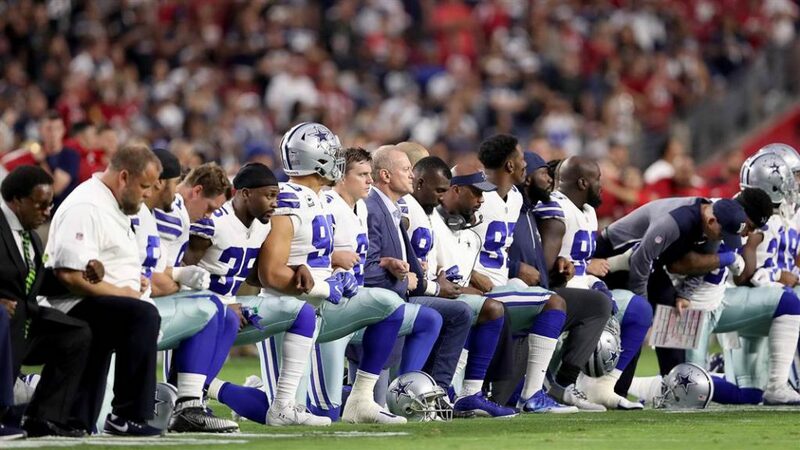 But the president says he wants that peaceful protest to stop… He says those players should be fired if they take a knee during the anthem, and calls those players a name I never thought I’d live long enough to hear a president say. It has not gone unnoticed that President Trump has spoken out against the Mexicans who want to come to America for a better life against the Muslims and now against the black athlete. He says nothing for days … about the white men who marched under a Nazi flag in Charlottesville except to remind us there were good people there. And when he finally tried to say the right thing not 1 of them was called an s-o-b, nor did he say anyone should be fired. Colin Kaepernick’s original message may have gotten muddled in the polarization of politics. But the truth is America has a race problem. Picking sides with the President or the protest shouldn’t be what this is about.